When Benjamin Franklin (B.F.) Goodrich passed away in 1888, the company he founded helped America get around easier, faster, and more comfortable with the development of the pneumatic tire. It was the rubber tire that helped fuel the American bicycling craze in the 1890’s. These “city folk” bicyclists now had the ability to explore the unknown countryside. There was no satellite navigation. Maps were of a larger scale and rarely showed country roads. As such, getting lost was a common part of the adventure. 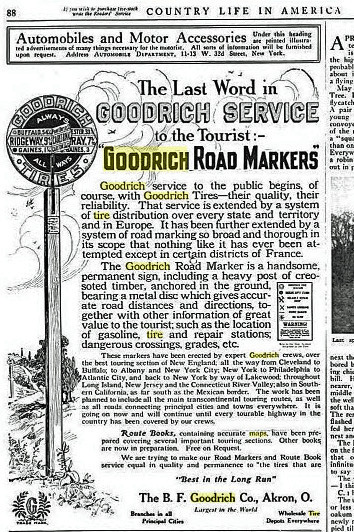 Seizing an advertising stroke of genius, the B.F. Goodrich Tire Company took the initiative to create road signs for the traveling public. The earliest road signs were made from sheets of metal with dimples in them to create letters and numbers. Later versions were then coated with porcelain and painted bright colors to help them stand out and last longer. Warning signs were typically round with a red background and white lettering for things such as railroad crossings. Signs giving directions were also circular but had a blue back-ground. Arrows would then point in the direction of a town with the town name and distance in miles printed on them. 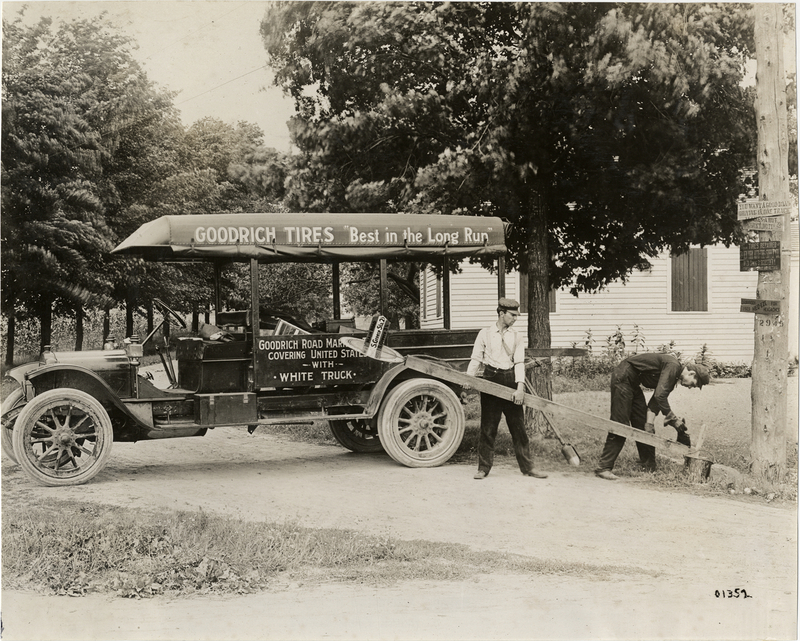 Lastly, all of these signs had the words Goodrich on top and Tires on the bottom to help promote the rubber tire maker. 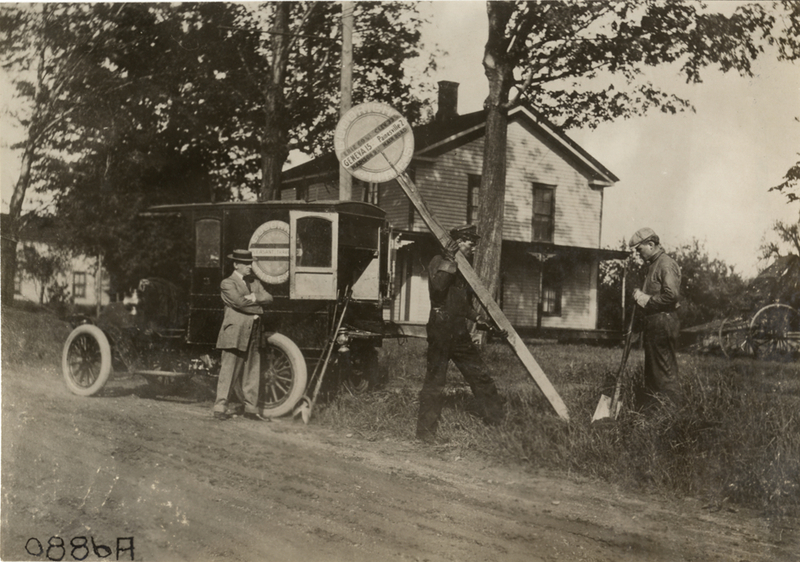 For a brief period of time, porcelain signs were installed on roadways throughout the United States from 1910 to 1917. Although originally intended for bicyclists, they were helpful for that new mode of transportation that was just getting started, the automobile. 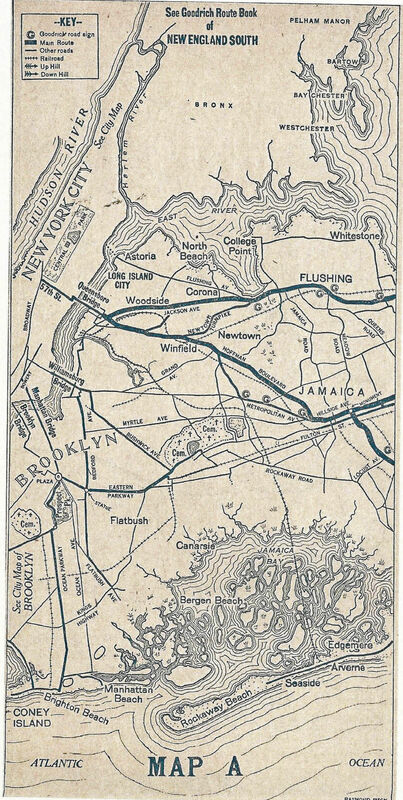 B.F. Goodrich also started publishing maps known as Goodrich Route Books. 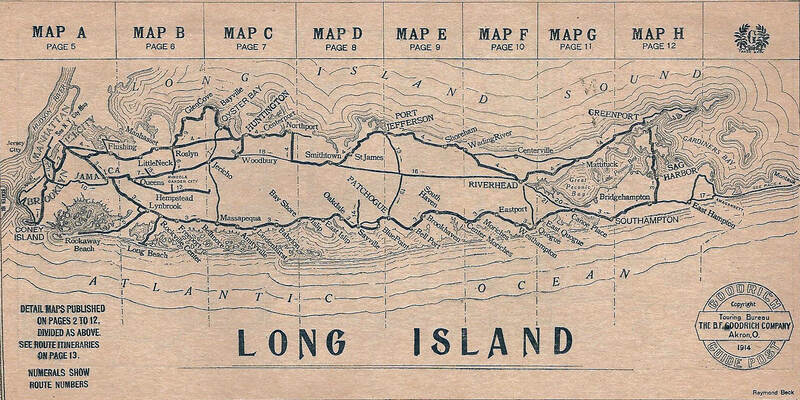 These early road maps were specific to a particular area, and included the location of the various signs along the routes (the first “You Are Here” type maps). These remained in use until the oil companies started making their own maps, of course for advertising. With the start of World War I, new signs stopped being made to save the metal for the war effort. By the end of World War I in 1918, it has been estimated that as many as 10,000 of these road signs were in use throughout the United States. The signs served an important need of the day and are now hard to find. The McHenry County Historical Society has a collection in Union and you can still find a few posted on some of the private farms around McHenry County. 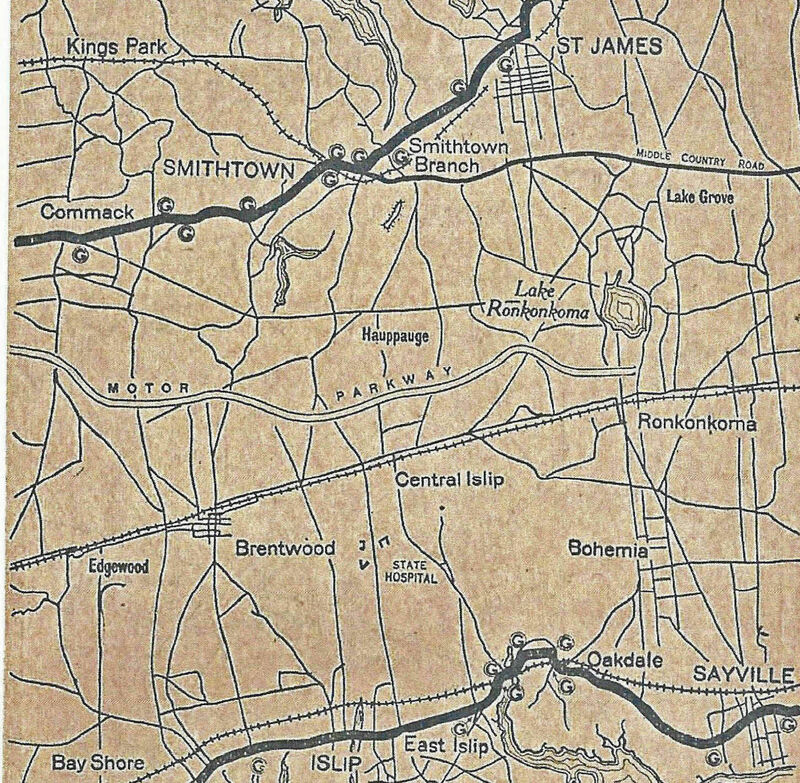 The 1914 Goodrich Long Island Route Book brochure featured an example of the road sign showing three directions: west (Brooklyn 25, Jamaica 5), east (Sag Harbor 92, Patchoque 40) and south (Islip). Can anyone figure out where this road marker may have been located? Howard, As I have written before, I much enjoy and appreciate your website and efforts and the weekly emails, even as I am usually stumped by the mystery photos! By deduction, I would like to suggest that the guide post pictured would have been one on the current Hempstead Ave/Blvd near Belmont Park and the Queens-Nassau County border (hence the 2 NYC and 2 LI locations). The history of Belmont Park note the massive traffic jams even in its opening year and the Automobile Blue Book from 1906 (Google lists this as being the 1908 book which is a scanning error) even has BELMONT PARK as a separate destination in its index. I believe you are misinterpreting the “ISLIP Direct Rd” part of the sign. 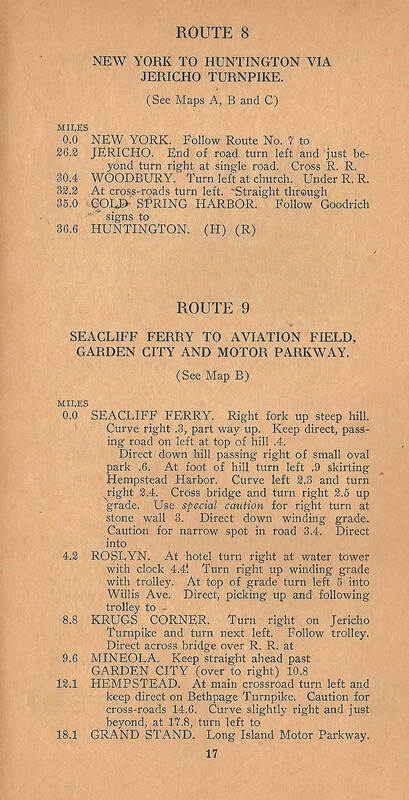 As there is no mileage indicated—as I have seen on other Goodrich guide posts—I believe this is a clarification of which routing it means, in this case, via Merrick Road, a high quality macadam road (at least in this area) for a number of years before 1914. Usage of “direct” would be like the modern-day straight-through and the word is used with Merrick Road in early Automobile Blue Books (as in “direct to Freeport”). Merrick Road would also be “direct,” in this sense, to Islip and helps distinguish this routing from the alternate route to Patchogue via Smithtown that the LI overview map shows. With some quick arithmetic, the mileages also correspond to the Automobile Blue Book of 1906 mileages, adjusting for a Belmont Park area starting point. The map around Belmont Park (your Scan-435_edited-1aaaa) has inaccuracies (no surprise!). The Belmont Park oval is drawn too far east: the map shows Foster’s Meadow/Elmont Road terminating below the oval and shows the oval extending east of the point where the Creedmoor line joins up with the LIRR main line—both incorrect. The western edge of the oval should have been drawn approximately under the QU of the QUEENS label, which itself crosses the county border! 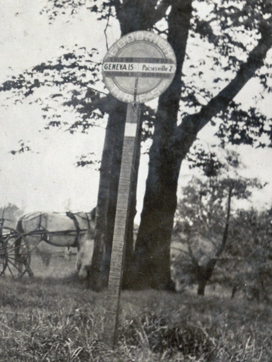 There are two “G” symbols near Belmont Park: one under the Q of the QUEENS label at Springfield Road/Blvd and the other at Foster’s Creek/Elmont Road. I would argue for the Springfield intersection, mentioned in the early Blue Book routings and a higher-quality road than the alternative. 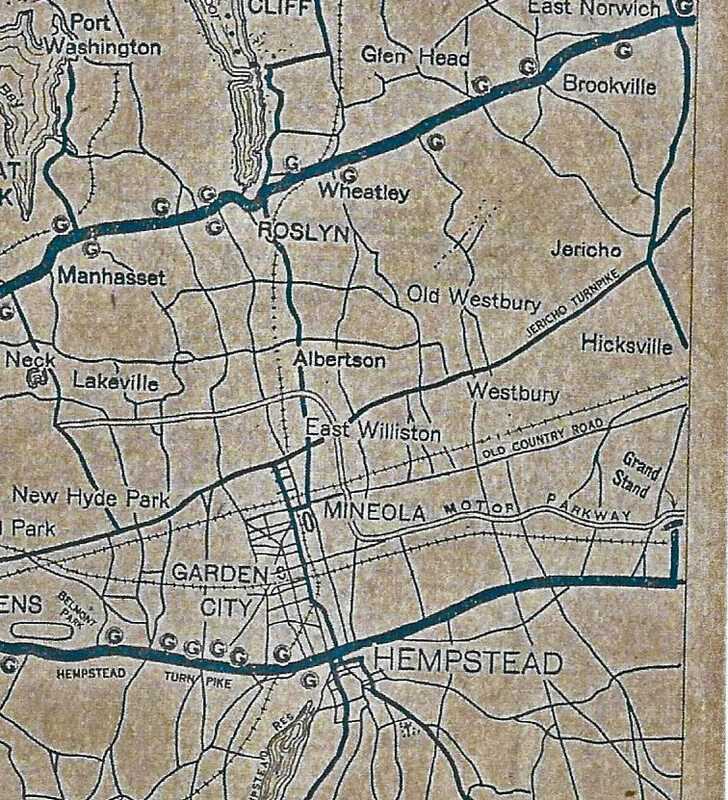 It would be also the turn south that a Manhattan-centric driver would take while driving on the Hempstead and Jamaica Plank Turnpike (or whatever the road was called in 1914). Using mileages from your 1914 Route Book (or the Automobile Blue Book of 1915) and/or adding up distances a bit more precisely than I did might help resolve things. 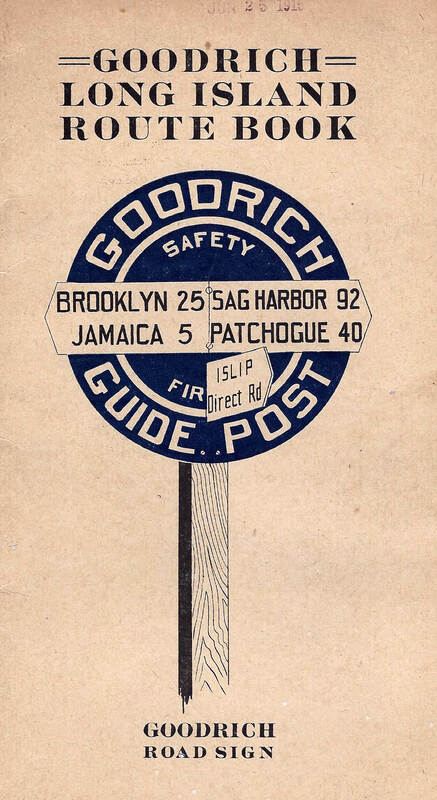 The brochure highlighted the heavily travelled north shore and south shore roads in which Goodrich posted their road signs. 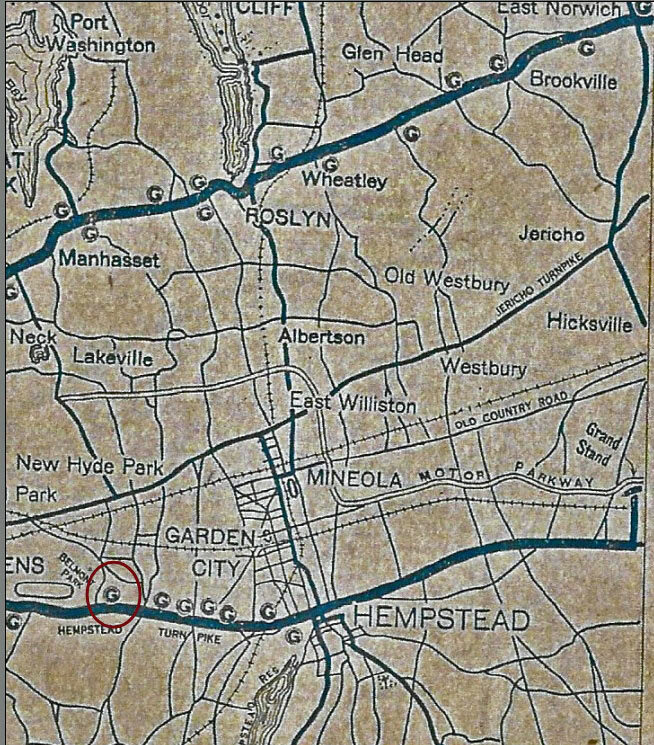 The Long Island Motor Parkway route can be seen in maps B,C & D.
Map B: The Motor Parkway route from Lakeville (lake Success) to the "Grand Stand". Note: the G indicates the location of the Goodrich road markers. 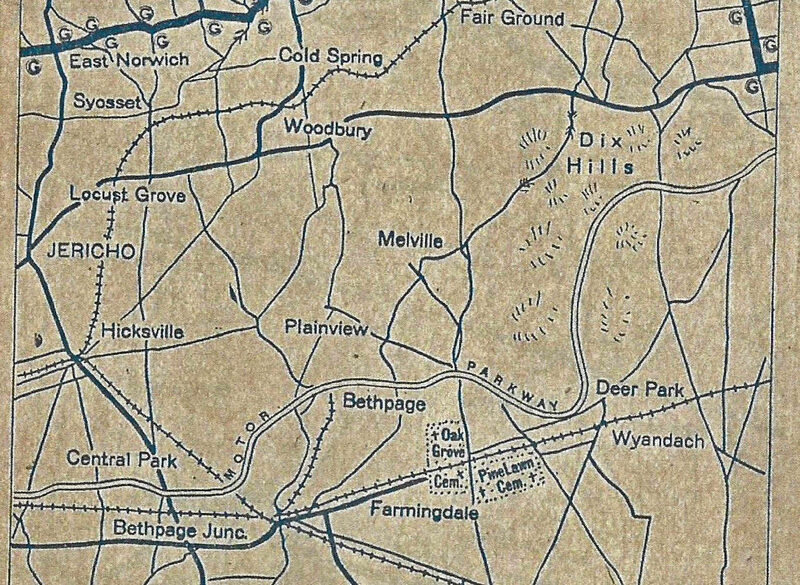 Map C: The Motor Parkway route from Central Park (Bethpage) to Dix Hills. Note: The route to Lake Ronkonkoma was changed. An example of the 21 routes provided in brochure. 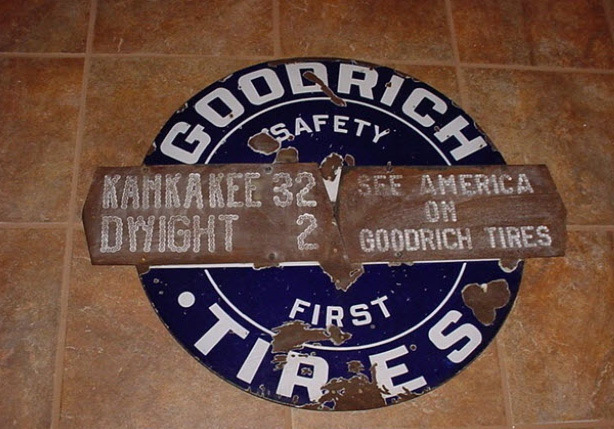 Over 10,000 Goodrich road signs were installed throughout the United States. Only a few have survived including this one from Kankakee and Dwight, Illinois. Courtesy of W. Worsham.